Lady Jade was the runt of the Little but you would never know it with her Attitude.. she is the first of her litter to bark at anything moving in the yard lol. She is such a ham and so lovable ..this is a Pic of her at 8 weeks old, the day we got her. Boy, you're not kidding! You can tell from her expression in the picture that she is full of personality! It's amazing how the runts can be so big and full of themselves in spite of their physical size. Definitely something for us to take note of. They don't let the fact that they're smaller get in their way - maybe we as humans should learn to be so resilient and persistent from their examples. Either way, good luck with your little lady. I am sure she'll grow up to be a great addition to your family! We lost our first german shepard a year ago.and were giving ourselves time...to heal...then we found her..online....Akroma...6 months of pure energy...cant wait to get to know her...thanks for sharing your picture. Congratulations on your new addition. Look at that baby! OMG what a cutie pie! Enjoy this precious time with her, they grow up so fast, next time this year she will be big. As she grows she might lighten up a bit, so take plenty of pictures. She will give you so much joy. My Mia just turned 2 yrs old last month and she is something else; very protective. Be careful of those ears, she doesn't scratch too hard, the carthage can break, just a precaution. Take care of your baby, she will grow up strong, big and powerful, she will be your protector - your Angel! 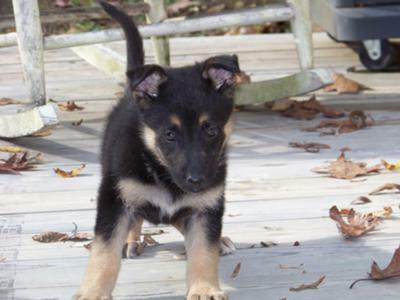 You can read our stories, puppy-mias-story and Mia, my Beautiful German Shepherd Dog.